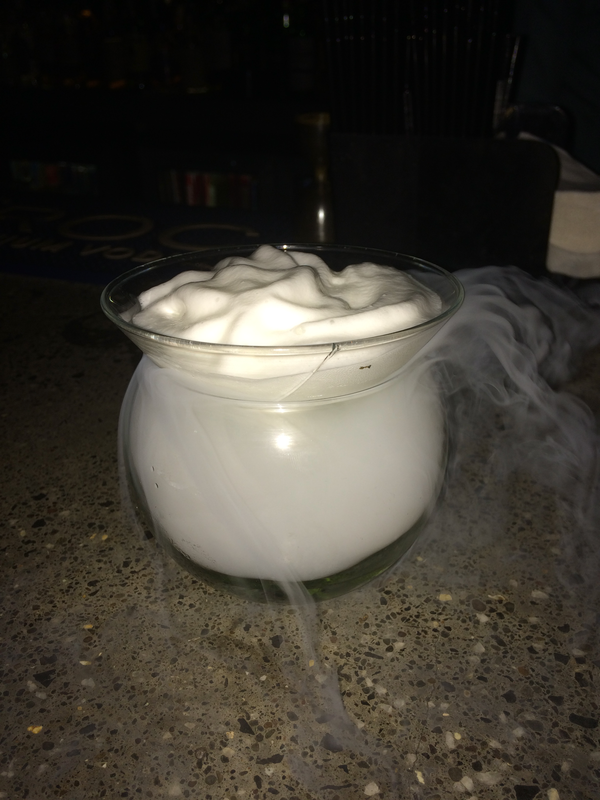 Let’s begin with the drinks because that’s how it gets started everywhere. There are 2 new cocktails added to the menu – Farzi Tina and Farzi Apple Foamintini (above). Farzi Tina is tastier of the two and it’s more in quantity as compared to the Foamintini. Both have Vodka as the base however, Foamintini is stiffer between the two and is presented in a damn nice way with the home-made foams (hence the name) that they use to give it an exotic touch. Next up was Bunta. Now this is something that I’ve heard of for the first time in Delhi, however, I couldn’t try it there (just my luck!). So when I saw this on the menu of a restaurant in Mumbai I had to try it. There are 2 variants – Kolavari and Aam Papad, I tried the latter one and it was tasty and the aftertaste was spicy rather than sour/ bitter, which was great. 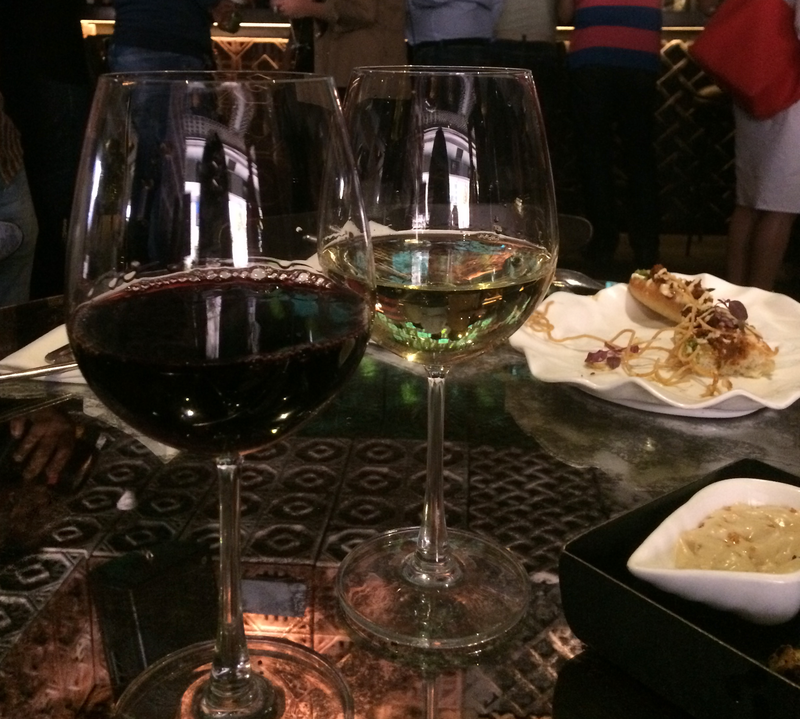 The restaurant has added new wines to its menu as well which includes, Sula Chenin Blanc, India (white), AG Forty Seven, Malbec, Argentina (Red), AG Forty Seven, Chardonnay, Argentina (white). Sula Chenin Blanc is the lightest among the three and had an almost sweet finish. AG Forty Seven, Malbec is the complete opposite, it’s dark and heavy and the finish is bitter and strong. AG Forty Seven, Chardonnay is alright. They have added couple of mocktails as well – Grenny Mint Royal and Strawberry Lemonade. 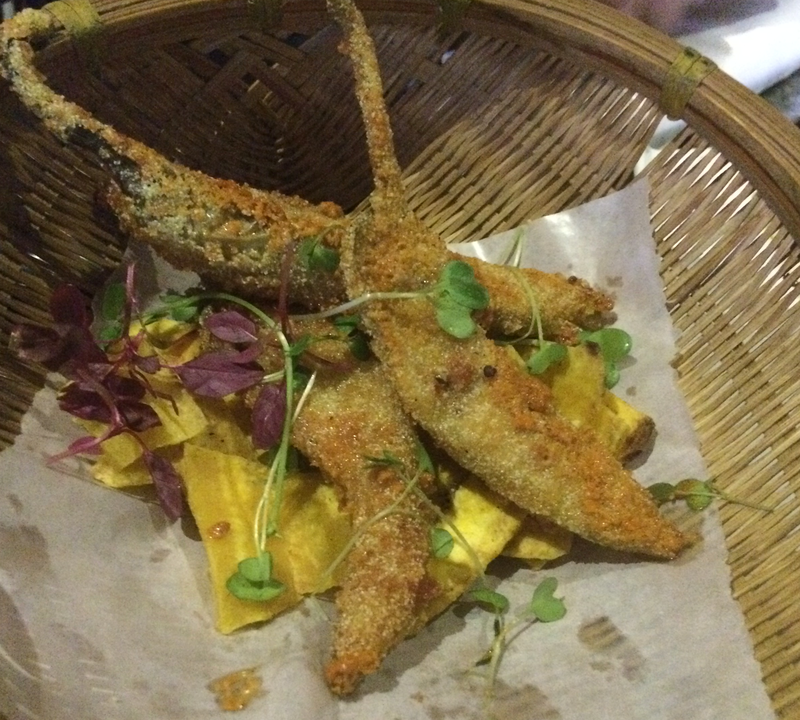 Moving on to food, Farzi cafe has added 6 new starters to the menu. 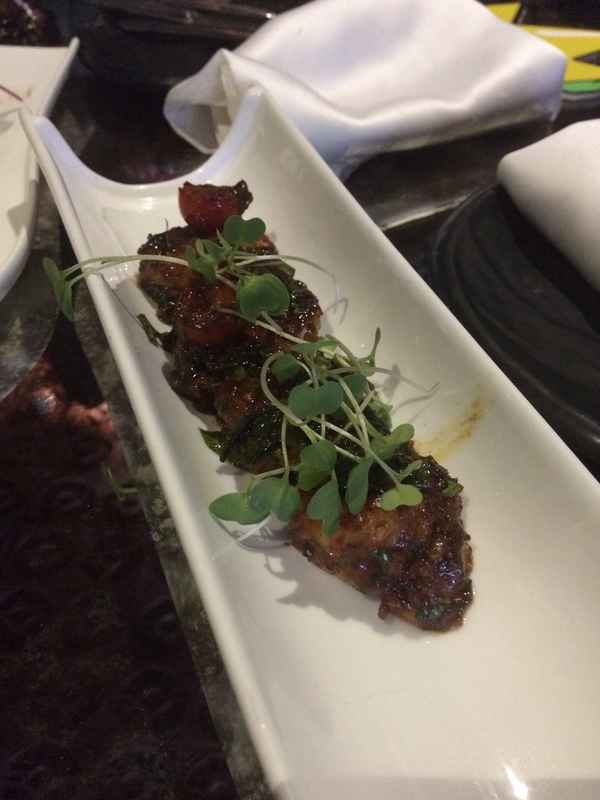 My favourite among these is Black pepper and golden garlic prawns with braised pokchoy. Nicely cooked succulent prawns makes this my favourite new entrant. 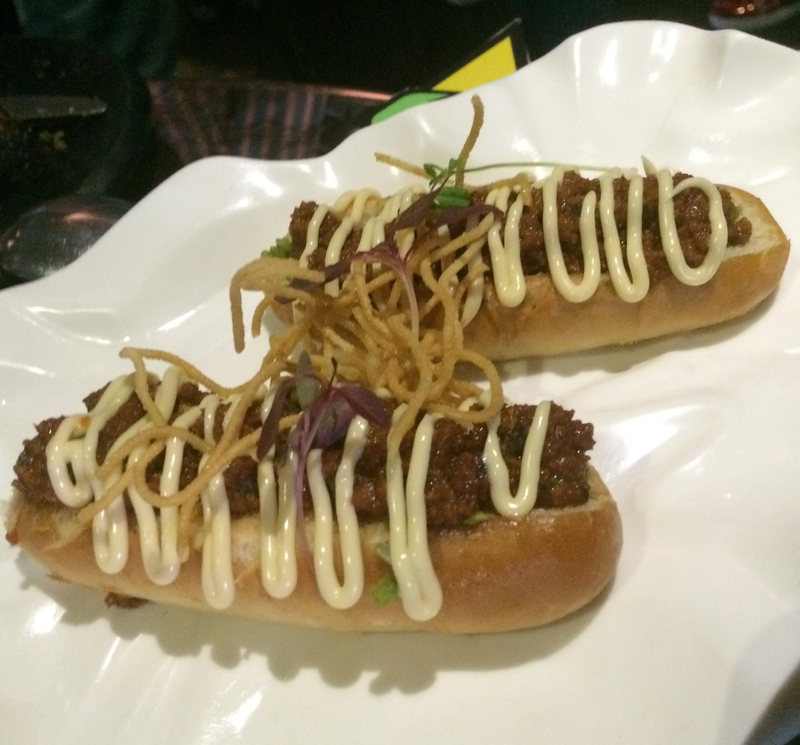 Not far behind is the Keema Ghotala Hotdog with onion and mint salsa. This one gets major points for presentation and looks thankfully the taste lived up to the show. 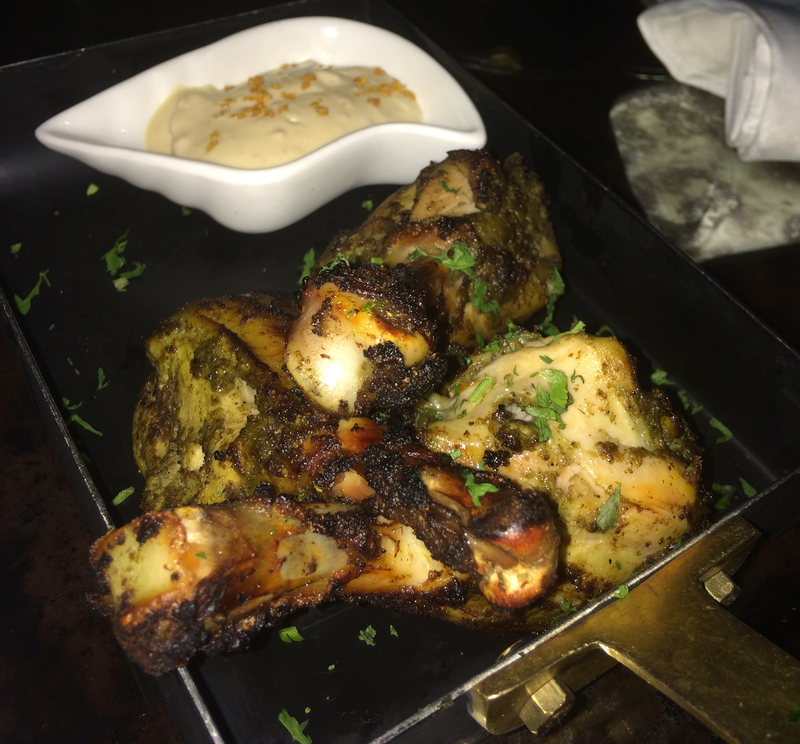 A noteworthy mention goes to Dak Bunglow Chicken with garlic boursin. The chicken is little overcooked but it adds to the charred taste and gets balanced out by the green spices used for marination and coating. 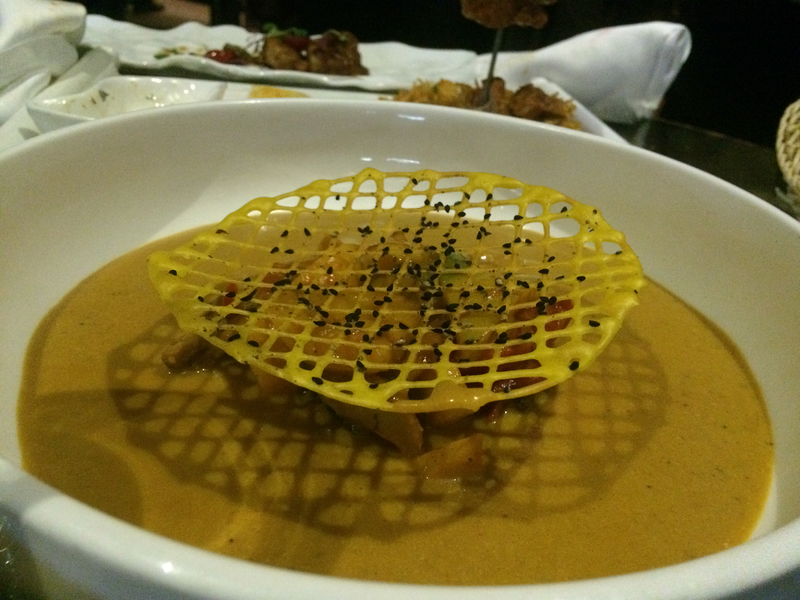 In the vegetarian starters, you must try the Mushroom Kurchan Kulcha with pan tossed simeji. 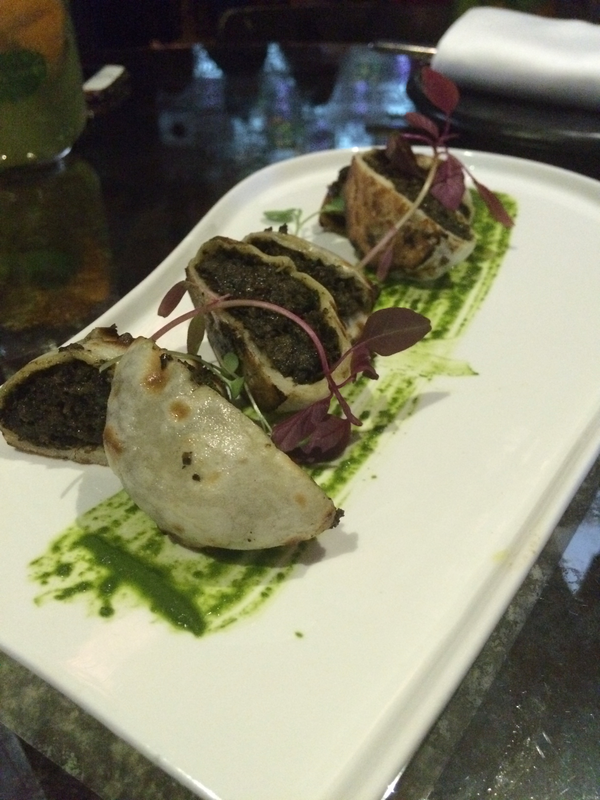 These are coin sized Kulchas stuffed with scraped mushroom and the taste is amazing. It’s not spicy but has a good mix of spices. I did not like the Besant Nagar Chilli Fritters (above) as I found it too oily. Upma and curried mozarella bites were bland for my taste buds maybe it’s because I was never a fan of Upma. In the main course, quite similar to their tasty butter chicken and naan, Farzi cafe introduced Chicken Tikka Masala with crunchier naan and it’s yum. I’ve tried the butter chicken when the restaurant had opened last year and so I had to try this addition before the other 4 on the menu. Shawarma Biryani (above) – the combination of two popular Mughlai dishes – is tasty. 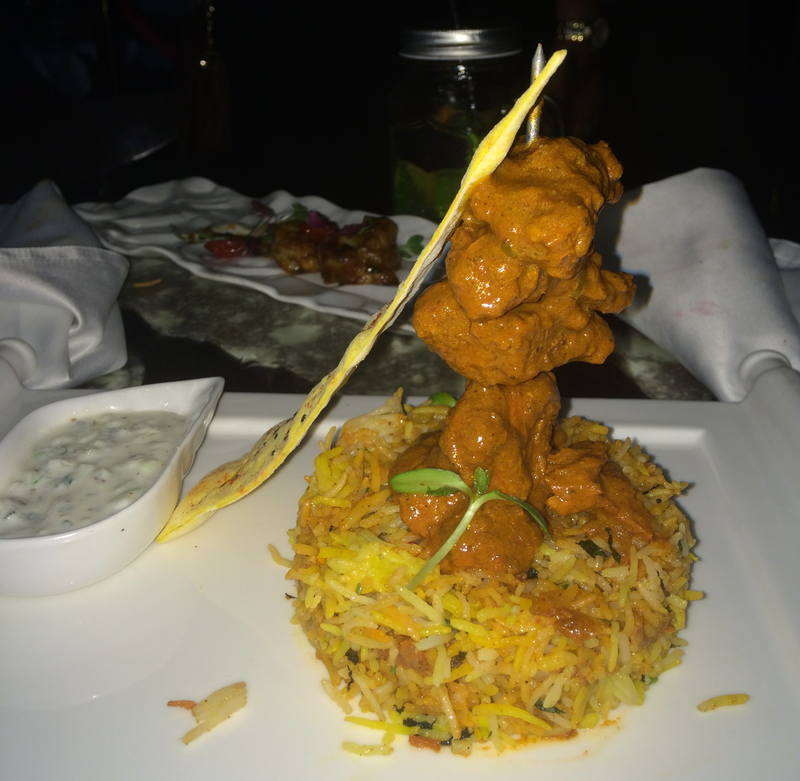 To know more about this I spoke to the Chef who said, “We cook Biryani separately and the lamb is cooked separately to ensure the juiciness and tenderness of the meat and right mix of spices in the rice”. This is one of the chef’s favourite too, so you know what you need to do. In the veg options, I liked the Bisi Bele Bhaat with charred artichoke and cherry tomato. The rice is cooked nicely and spices used enhances the overall taste. 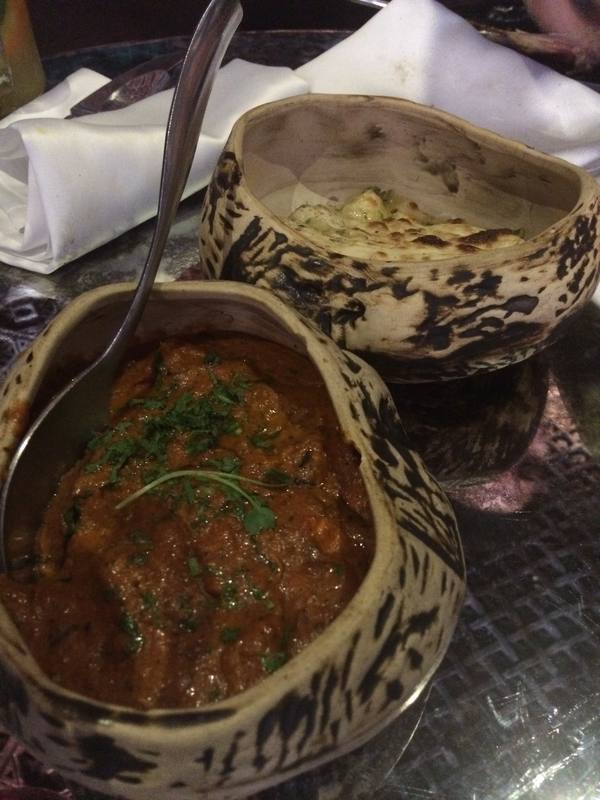 Peanut tamarind salan (above) with dhania kulcha and wok tossed vegetables was nice. There’s hand pulled pork kootan with fried cashewnuts and malabari paratha but I didn’t taste it. Chef said it’s one of the great dishes. 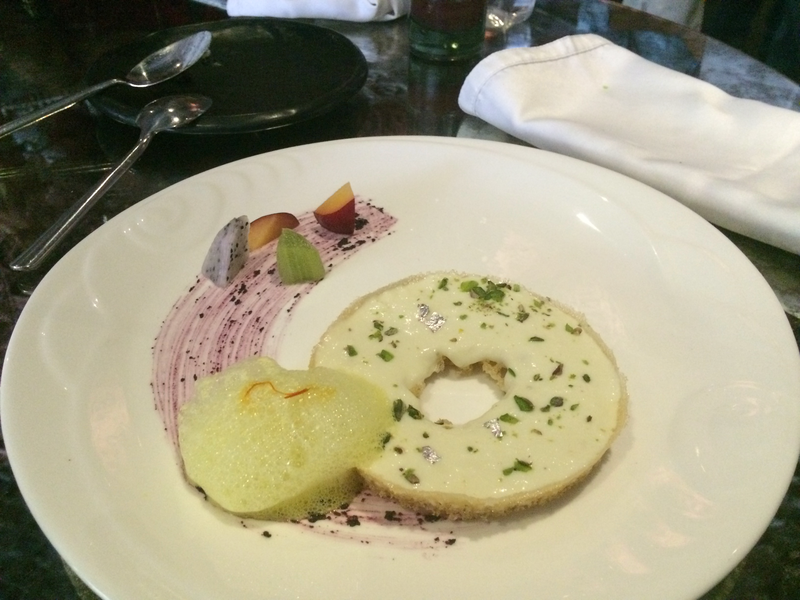 Coming to the desserts, I’m not someone who loves desserts but I loved the Ghevar Malai Tart with saffron aire. The presentation, taste, texture, everything is spot on. It’s sweet but not too sweet. Farzi Sundae with pistachio, blueberry and brownie was a mixed bag with so much in it that I found it rather confusing and not so good. Needless to say, after the tasting I was pretty full. But then I had to try their amazing candy floss paan. 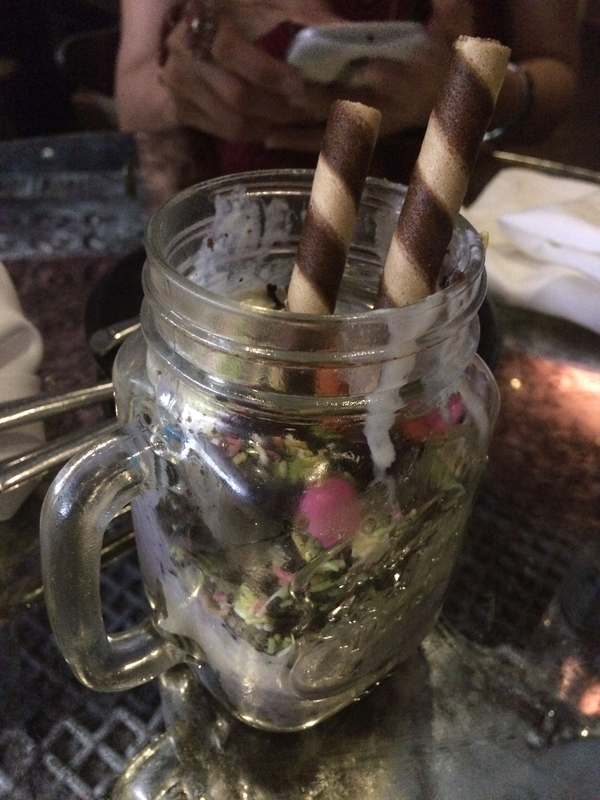 The candy floss melts in your mouth and leaves your taste buds to taste the yummy sweet toppings of a paan. Overall, most of the additions tasted good. About the new menu Chef said, “We picked out 5 dishes which weren’t doing well on the menu and replaced those with 20 new dishes to give our customers more options to chose from. For us customer is the king and we want them all to be happy with their choices here at Farzi cafe”. So if you find yourself in the vicinity do check out these new entrants at Farzi Cafe and tell me how you like it in the comments section below.